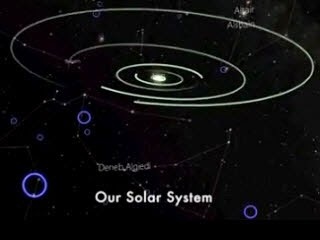 This conception of our solar system's bordering stars takes you on a dizzying journey away from Earth, leaving you moving among all the other known solar systems in our resident area of the Milky Way Galaxy. And it is so beautiful that it might leave you a little emotional. The American Museum of Natural History produced this conception to go with a paper that museum astrophysicist Ben R. Oppenheimer and associates will be issuing in Astrophysical Journal. The paper is related to Project 1640 at the Palomar Observatory, which uses a new method to analyze the spectral signs of distant exoplanets. Lately, the group examined four planets in orbit around HR 8799, a star that is 128 light years from Earth. They call their plan "remote reconnaissance of a solar system."